Dr. Richard Payne, Dean of the Institute of Buddhist Studies, and the Rev. Dr. Daijaku Kinst, IBS Chaplaincy Program Director, participated in a Ryukoku University International Symposium on September 26-27, 2013, at the Omiya Campus, Kyoto, Japan. The program was sponsored by the International Center for Humanities, Science, and Religion (CHRS). Responses were made by Professor Nobuhiro Fukagawa and Professor Akio Tatsutani for Dr. Kinst and Dr. Payne’s papers respectively. Professor Naoki Nabeshima, Director of CHSR, joined in on the discussion following the presentations. “The conference provided the exploration of different aspects of Buddhist practical ministry and chaplaincy and the important ways we can learn from one another,” stated Dr. Kinst. 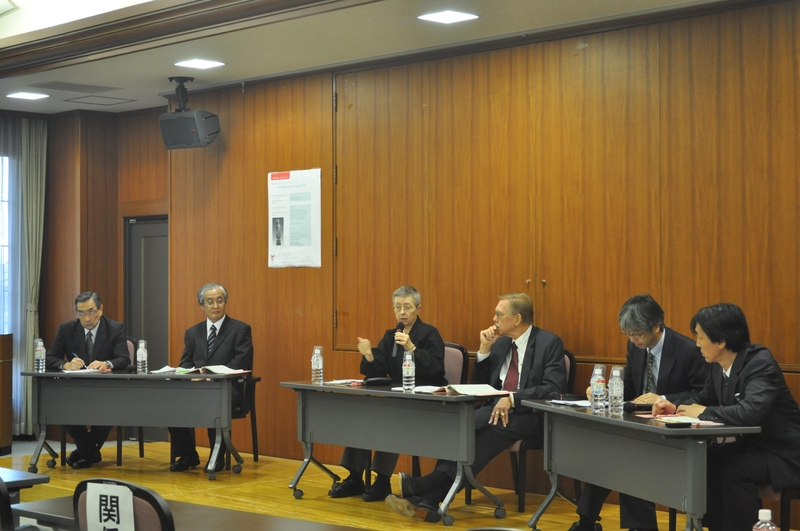 Panel left to right: Prof Fukagawa, Prof. Tatsudani, Dr. Kinst, Dr. Payne, Dr. Eisho Nasu, and Prof. Nabeshima.